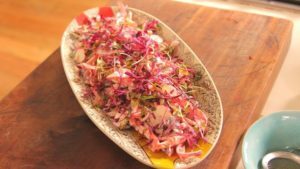 South African Red Salad; The tastiest, lightest salad! This is an elegant salad that would be fabulous to serve on a buffet table for a summer supper or braai. It is delicious served with char-grilled meats, chicken or fish. This gourmet salad not only looks beautiful but tastes so light and fresh, it’s perfectly paired with boerewors! 1. Mix the salad ingredients together in a large bowl and toss well. 2. Then mix the dressing ingredients together, season with salt, pepper and sugar to taste. 3. Toss the salad with the dressing, then transfer to a serving platter and garnish with micro herbs and serve. TIP: Serve with bite sized boerewors for a wonderfully light South African lunch!